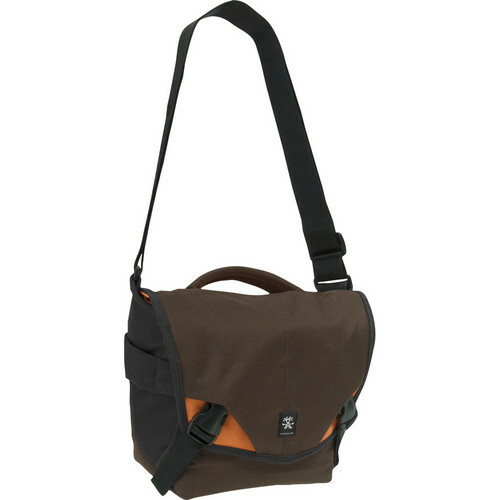 The brown, orange, gun metal gray 5 Million Dollar Home Camera Bag from Crumpler is a 900 denier, water-resistant, nylon shoulder bag made to carry photo gear with accessories. The bag can be customized using the 2 moveable dividers in the main section. It has a 2 strap with 2 buckle closure and a touch fastener Silencer flap that prevents the "hook and loop" closure from being used. There are four pockets for accessories and the bag is carried by a padded handle or an attached, adjustable shoulder strap. Box Dimensions (LxWxH) 11.4 x 6.4 x 9.0"
5 Million Dollar Home Camera Bag (Brown, Orange, Gun Metal Gray) is rated 4.8 out of 5 by 5. Rated 5 out of 5 by Cam from Brilliant Crumpler Bag The 5 Million Dollar Home (5MDH) is a brilliant camera bag that doesn't look like a camera bag, and offers excellent security: extremely loud velcro backed up with solid clips. Internally there is plenty of room. Mine currently has an Olympus E-P3, a couple of lenses, an electronic viewfinders, a box of Cokin filters, adaptors and a full cleaning kit. It also fits my Kindle and Gorilla Pod when I'm trying to avoid unwanted attention. My only complaint is that as carry-on it take up quite a bit of room under the seat in front, although it is solid enough to travel in the overhead lockers. Rated 5 out of 5 by Ed from Best walk around camera bag I am able to fit a full frame DSLR, 24-70 with lens hood, a flash and a 85mm lens. Good enough padding, and good quality materials. The silent velco is definitely useful when I'm heading to museums or concert halls. I don't draw as much attention when I'm pulling out gear. Overall, I recommend this! However, if you bring a full frame, 24-70 and a 70-200. You may want to get a bigger one. (I haven't tried that much gear into the 5 million bag. Rated 5 out of 5 by Meatball from Rowdy bag This is my 5th Crumpler bag. They are great quality and look awesome. Rated 5 out of 5 by PictureChick from Perfect for Micro 4/3 and all acessories I love this bag and I am so glad I splurged to get this for my new Olympus Pen Micro 4/3 Camera. This bag is the perfect size for the amateur to intermediate photographer. It stores all of my camera equipment with room to grow. It is extremely well constructed, comfortable to carry and extremely secure. It holds my camera with the 14/42 lens attached in the center compartment with room to spare, and my 40/150 zoom lens and my Pentax Optio w90 point and shoot waterproof camera in the each two side interior compartments with room left over for hoods as well and at least another lens. It also holds my iphone, maps, lip gloss, compact, cough drops and keys among other things in the two interior slip pockets. I store my lens converter, filters, extra memory cards and lens cloth in the front pocket and or in the mesh pocket in the flap which has also doubled as a change purse/wallet for my passport, tickets, credit cards and cash. I've had this bag for six months and it is the only camera bag I use now. I've taken it on multiple day trips to the zoo, botanical garden, NYC, on a family vacation to Disney and to various family outings and to my children's school events and music recitals. I just can't tell you how much I love this bag. I wear it in the messenger position across my body and the wide easily adjustable strap is very comfortable, even without padding. I love the quality of this bag, but my favorite part is that it LOOKS like a purse and isn't as conspicuous or as bulky as a traditional looking camera bag. The velcro closure is quite loud when opening and closing, which might be a problem if you're shooting wildlife or in a very quiet indoor venue, but so far it has not been a problem for me. I just open it slowly when I need to be discreet. I have the olive green bag with orange interior/black straps that looks very similar to the brown/orange one listed here. If you are looking for a hip and practical modern camera bag that will hold everything securely and comfortably, then this bag is for you! You will not be disappointed.